Why is Dharma so elusive? A meaningful life requires a profound approach. Few are willing to look that deeply. Even fewer live true to what they find there. What are the Dharma Sutras? “Sutra” means thread. These Sutras weave a tapestry that mirrors your essence. Reflect upon them to discover your greatest gifts and fulfill your deepest longing. I’ve never seen a relationship book that takes me so much deeper into myself, and I now realize just how much my own internal relationship with myself affects my relationships with others. – Dave E.
Dharma Sutras gives me a feel for how diverse the world is. In some ways- I feel how my tendency is to see how I don’t fit. But there’s a way that this takes me to a place that’s deeper inside – so I know me. It’s not about retrofitting me into the world. – Denise H.
The concepts in this book are refreshingly different. It’s not the standard ‘pop psych’ stuff that’s out there. And they are right on. 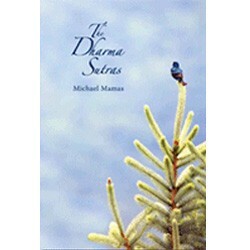 – James R.
One of the things I love about this book is that the Relationship Sutras apply to any kind of relationship. I use it in my primary relationship, as well as with my family, friends and co-workers. – Nancy K.
What a touch stone. I keep it on the kitchen table where I have tea every morning. – Nancy C.
I like that this book combines relationships with spiritual principles. It creates a basis that is deeper than anything else out there. It’s uplifting. – Jason M.